It's frustrating when you get an error after sending an email message. This topic describes what you can do if you see status code 550 5.7.124 or 5.7.124 in a non-delivery report (also known as an NDR, bounce message, delivery status notification, or DSN). You'll see this automated notification when the sender sender isn't specified in the group's allowed senders list (directly or as a member of a group). Depending how the group is configured, even the group's owner might need to be in the group's allowed senders list in order to send messages to the group. I got this bounce message. How do fix I it? I'm the group owner or email admin. How do I fix this? I got this bounce message. How do fix I it? Typically, members of a group can send messages to the group. If the group is in your Exchange Online organization, you can try to join the group in Outlook or Outlook on the web (formerly known as Outlook Web App). 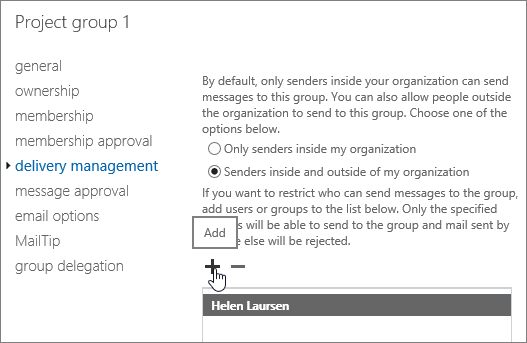 For instructions, see Join a group in Outlook. You might have to wait for the group's owner to approve your request to join the group before you can successfully send messages to it. If the group isn't in your organization, or if the group doesn't allow requests to join, then you'll need to ask the group owner to add you to the allowed senders list. You'll find instructions for finding the group owner in the NDR. I'm the group owner or email admin. How do I fix this? The two methods that will allow the sender to send messages to the group are described in the following sections. In the EAC, go to Recipients > Groups > select the group from the list, and then click Edit . In the group properties dialog box that opens, go to Delivery management and then click Add . 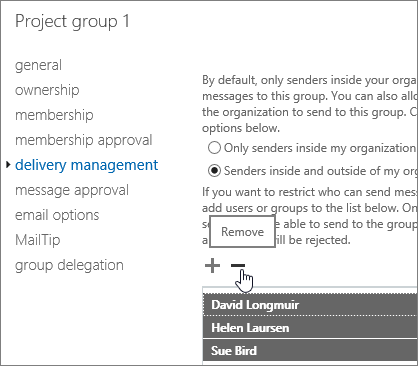 In the Select Allowed Senders dialog box that opens, select and add the sender or a group that the sender is a member of. When you're finished, click OK.
To add an external sender to a group's allowed senders list, you must first create a mail contact or a mail user to represent the external sender in your organization. In the group properties dialog box that opens, go to Delivery management. Remove any entries in the allowed senders list by selecting one entry, pressing CTRL + A to select all entries, and then clicking Remove . Senders to the group must be members of the group. Messages sent to the group require the approval of a moderator. To configure moderation for a group, see Configure a moderated recipient in Exchange Online. Large messages can't be sent to the group. However, senders of large messages will receive a different NDR. For more information about large messages, see the "Distribution group limits" section in Exchange Online Limits. Still need help with error code 550 5.7.124? Create and manage distribution groups in Exchange Online.